Whether navigating an oil tanker, cruise ship, fishing vessel, sailboat, or any craft, the mariner requires a suite of navigation charts that are consistent and easy to use. 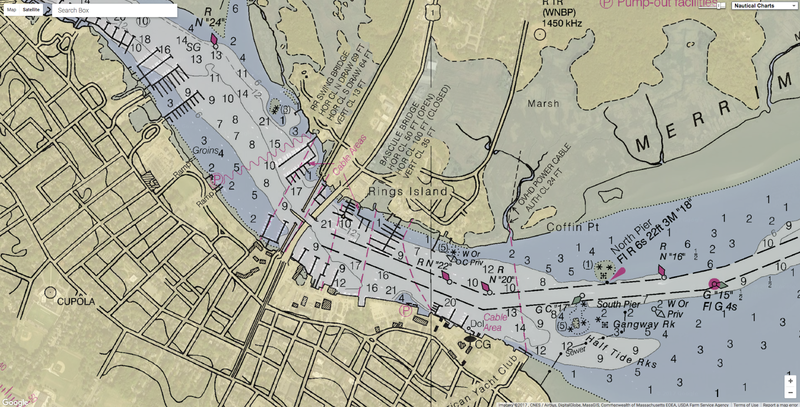 The public feedback we received to the National Charting Plan regarding the “sunset of paper” charts (p. 26) highlights two navigation products in particular, NOAA paper nautical charts and raster navigational chart (RNC). 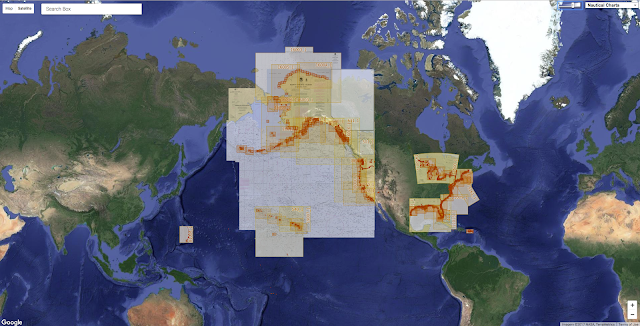 We recognize the continued popularity and dependence of many of our users on our paper and raster charts, and NOAA will continue to update these charts with all critical information. Despite some reports to the contrary, the draft plan does not offer a timeline for ending the production of NOAA paper charts or RNCs. We expect this process may take decades to complete, as user communities continue to adopt electronic navigation and our production system and products continue to improve. However, we do want to start the conversation and solicit feedback to focus our improvement on electronic navigational charts (ENC). In response to a surge of interest in the past few weeks, although the official comment period ends June 1, 2017, as stated in the Federal Register Notice, we will continue to accept comments on the National Charting Plan through July 1, 2017. The ENC vector chart is still relatively new and needs some improvement. We recognize that in many cases, the ENC is not as easy to use as its paper equivalent, even though it satisfies all requirements for safe navigation. The long-term goal at NOAA is for ENCs and charts derived from them to surpass paper charts in all categories and for all mariners to prefer them to paper. 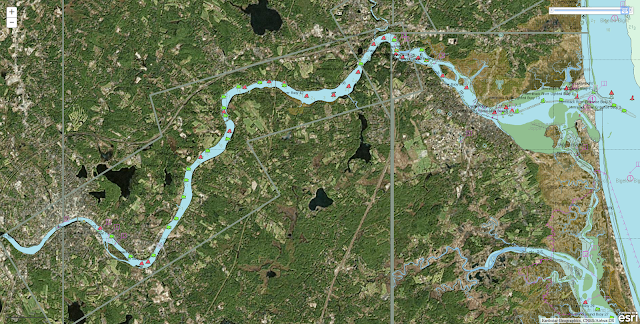 The Merrimack River (US5MA1AM) provides an example of how a new NOAA ENC® fulfilled a local request for larger scale data. 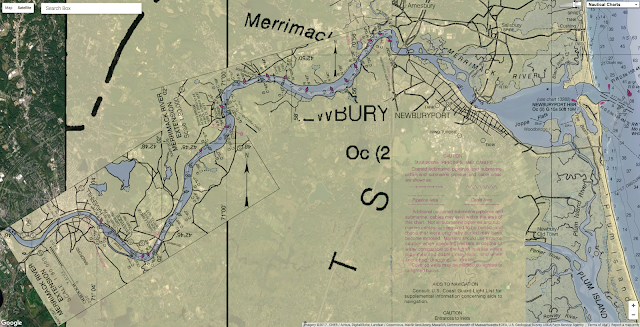 Historically, charts did not depict the river from Newburyport to Haverhill, MA, at an appropriate scale for recreational boaters to navigate safely. NOAA created a robust 1:12,000 scale ENC (without corresponding large-scale paper and RNC charts) to allow recreational boaters to navigate safely on the river. NOAA intends to increase its large-scale coverage in recreational areas but does not believe that it is always practical to offer corresponding traditional paper chart coverage. 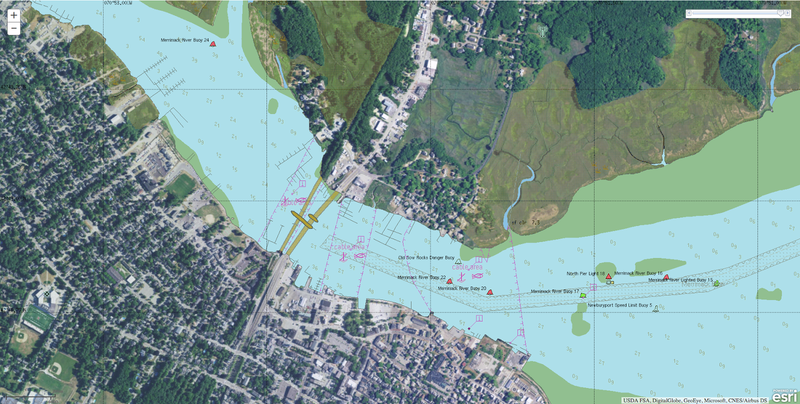 Large-scale data across large areas is better suited for use in electronic navigation systems for both regulated and recreational mariners. Panbo : Is it true news that "NOAA wants to stop making NOAA charts"? 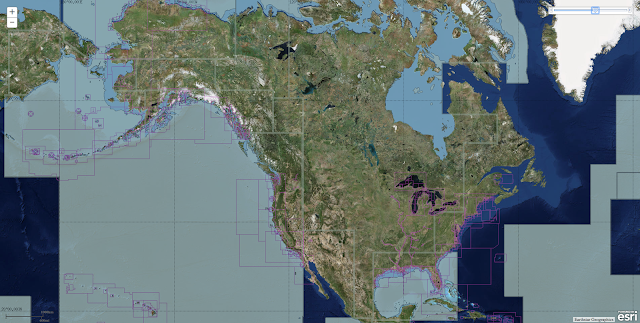 "On February 28, 2017, NOAA released their National Charting Plan. It's a document describing their outlook for nautical charts in the future. It's worthwhile reading - just search on: National Charting Plan. Four months passed and not much was said about the 31 page document. Then all of a sudden, a paper chart producer surmised that NOAA was saying that paper charts would no longer be possible and even gave a date when raster charts would not exist any longer. This ember was given a little fuel when the director of NOAA's OCS was quoted in the media as saying, "the paper era is finished." I applaud NOAA for helping to move a few last holdouts away from their paper addiction. It should be noted that in 2018, Solas ships will all be required, yes, required, to have electronic nautical charts in use. Paper by itself is no longer considered safe enough on ships. But this isn't about the paper debate which, to be honest, is irrelevant. If you love using paper charts, then by all means keep using them. This newsletter is about a single word that cannot be found anywhere in the National Charting Plan. It is a word that is so obviously central to life today that its omission should shake the authors into rethinking their entire plan. The Internet has taken over much of our lives. It is the mechanism through which we communicate today. We research information, find products and services, and share our lives with others. I can remember the early days of purchasing products over the Internet. And yet today, most of us make more purchases over our keyboards and tablets than we make face-to-face. Originally there were paper charts. The widespread use of GPS, just a couple of decades ago, marked the beginning of the end of paper charts. 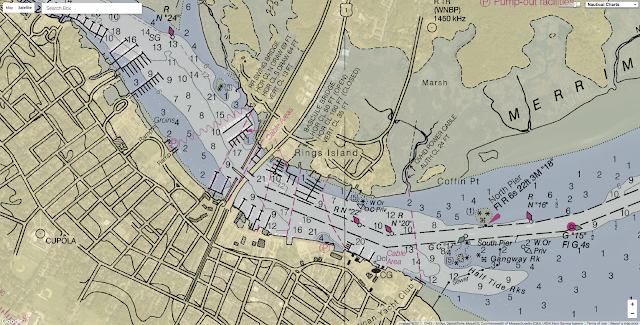 And it's now the Internet that marks the beginning of the end of electronic nautical charts. This is why the paper debate has become irrelevant. The real debate is about the end of ENC's caused by the widespread acceptance of the Internet. It's like arguing that rotary dial phones are better when we've moved past push button phones and now live in the cellular world. The Internet has affected nearly every part of our lives. It certainly has affected boating in numerous ways. Why shouldn't it affect navigation? And of course it will. And it will add fantastic capabilities for cruising boaters. NOAA's main charter is to serve the commercial and military uses of our waterways and coastlines. The recreational areas are a minor concern and with budget cuts, the surveying of our cruising areas is not getting attention. Taking all nautical charts today, it has been reported that 40% of the soundings in the charts were last surveyed before 1940. Of course there are large parts of the sea floor that don't change. But we're talking about 40% of the soundings being very old and collected through techniques that we wouldn't even recognize today. So paper, raster, vector, ENC's? Will it really matter in the future? Consider instead that we're close to global, inexpensive, satellite Internet. It is the last electronic horizon to conquer. Does anyone think it's not coming in our lifetimes? The capabilities of ubiquitous Internet will impact our cruising much like GPS affected it in the early 90's. When I read the National Charting Plan, I'm not concerned about whether there are hidden signals about plans for paper charts. Instead, I wonder how any document looking into the future doesn't consider the Internet as a central theme. And yet, that one word remains completely missing from the plan."